To mark 10 years of Lumiere, we’re revisiting some of the artists featured in the festival, starting with Fujiko Nakaya and her spectacular fog sculptures. 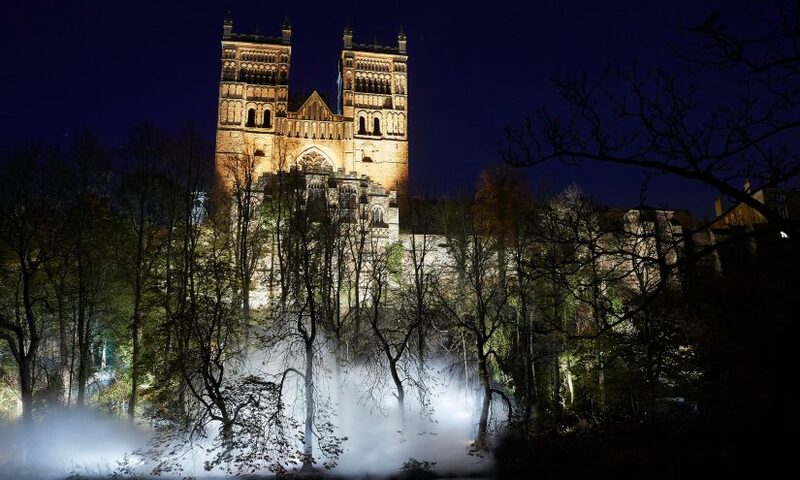 The countdown to Lumiere Durham 2019 has begun and to celebrate ten years of extraordinary light art, we’re looking at some of the local and international artists we’ve commissioned over the years. 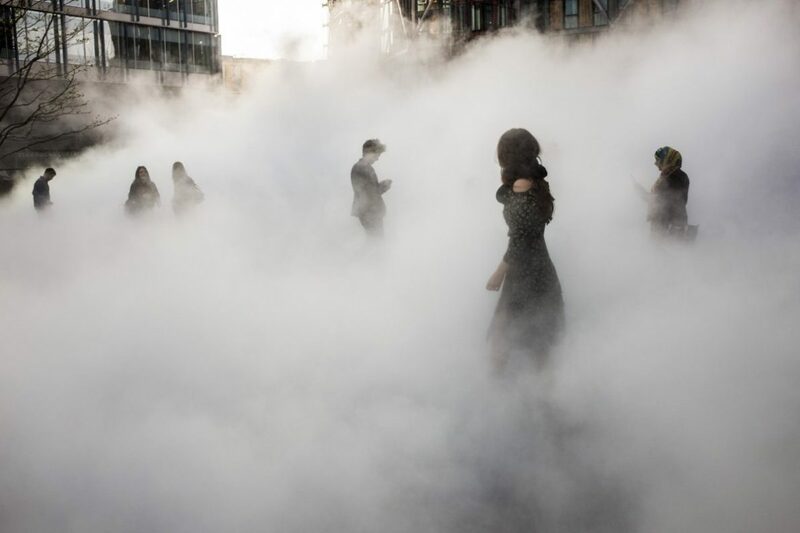 In this first post of the series we’re delving into the fascinating life and practice of Fujiko Nakaya, the Japanese artist who’s been transforming public spaces across the world for over half a century with her ephemeral fog sculptures. 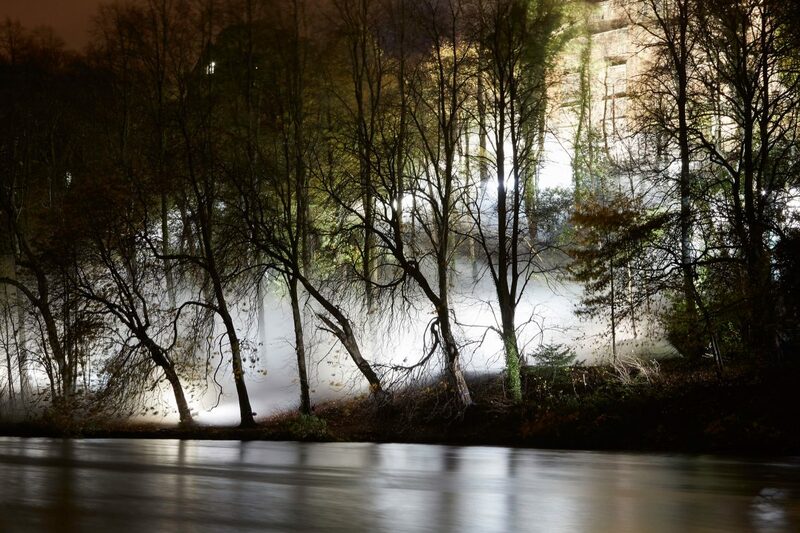 In 2015, Nakaya brought a new work, Fogscape #03238, to Durham in collaboration with lighting designer Simon Corder. The construction of Fogscape #03238 was a huge technical achievement. 1,500 high pressure nozzles supplied by French fog specialists Dutrie were positioned along 150 meters at the mouth of the River Wear, 200 light fixtures were installed by Newcastle-based Nitelites. During the final hour of Lumiere, Nakaya’s Fogscape #03238 gently dissipated, as if blown away by a gust of wind. “The fact that it disappears is the part I like most about fog. But it does not really disappear.” She said. Fogscape #03238 invoked the spirit of St. Cuthbert, rising around the trees and floating up to the Cathedral perched on a peninsula rock above the River Wear. 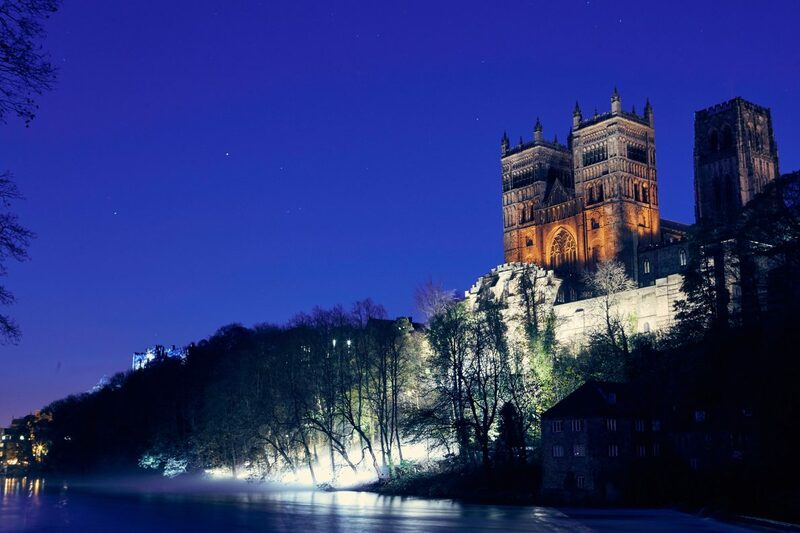 According to local myth, during the Second World War, St. Cuthbert, the saint of the Northumbrian church, whose tomb lies in Durham Cathedral, is said to have summoned a mysterious fog which shrouded the city and saved Durham’s ancient landmarks from the Baedeker air raids. ‘London Fog #03779’, Fujiko Nakaya, Tate Modern London, 2017. Photo by Lorenzo Ferrarini. In 1970, Nakaya created the world’s first fog sculpture by wrapping mist around the Pepsi Pavilion in Osaka with the aid of the engineer, Thomas Mee, and over the last 40 years she has created more than 70 of these immersive “situations”. Once in the cloudy midst of it, the fog forces you to use your other senses to orientate yourself and despite dampening clothes a little, being shrouded in water vapour in the middle of a crowd is a calming, magical experience. ‘Fog Bridge’, Fujiko Nakaya, Pero’s Bridge, Bristol Harbourside, 2015. Commissioned by In Between Time. Photo by Gayle Laird. 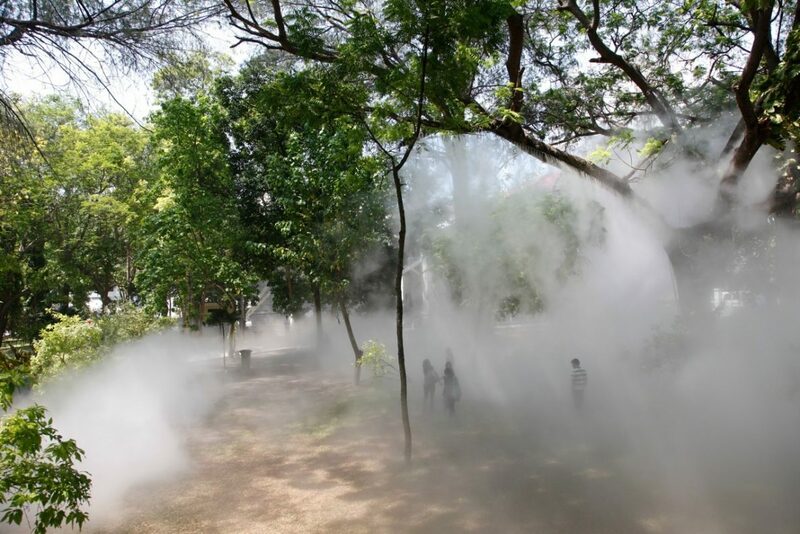 ‘Fog Sculpture #43555 ‘Cloud Tree of Maldives’, Fujiko Nakaya, Maldives, 2012. Photo by Kenji Morita. Since Lumiere, Nakaya’s sculptures have continued to emerge in more cities across the world from Boston’s Emerald Necklace Conservancy to the Art Tower Mito in Japan, reshaping the idea of what an artwork can be. Her “situations” make the everyday environment disappear and make the usually invisible natural elements, like the wind, become visible. 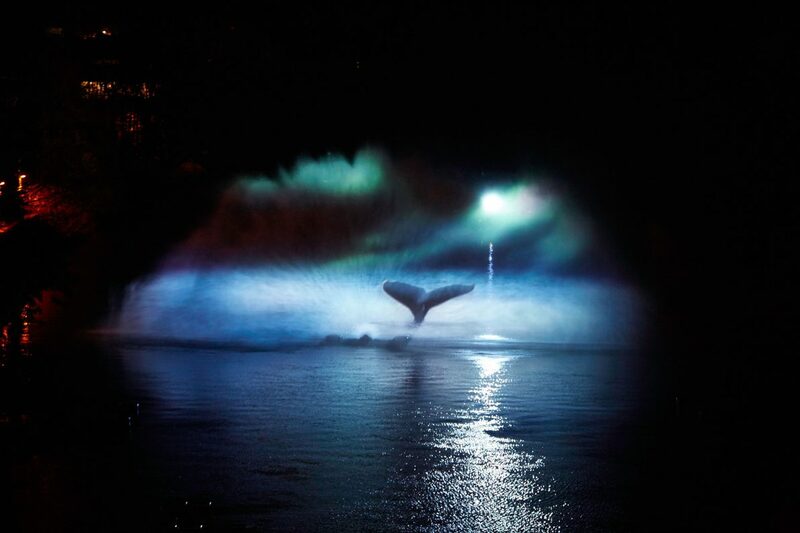 As with other Lumiere highlights such as Top’ Là and Catherine Garret’s Mysticète, the colossal whale apparition projected onto a veil of water that rose from the River Wear, the magic of Nakaya’s fog lies in its fleeting beauty, which captures the imagination off-guard and evaporates just as unexpectedly.